Rising sales volume and revenue are no longer translating into a corresponding rise in profit for top automobile firms like Maruti Suzuki, Hero MotoCorp, Bajaj Auto, and Ashok Leyland. 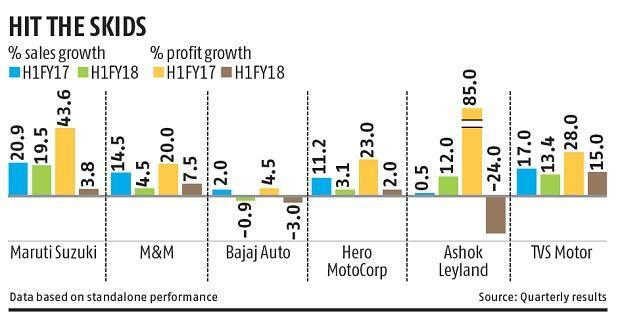 Profit growth at these companies have considerably slowed from high double-digits during the first half (H1) of FY17 to a low single-digit this year, thanks to the adverse movement in commodity prices and a challenging market environment. Many companies are also faced with higher tax and a wage burden. Maruti Suzuki, the country’s biggest car maker, saw its profit grow by less than four per cent in H1 this year, against 43 per cent in the same period last year. Sales revenue, however, grew by an identical 20 per cent, both this and last year. Volumes of passenger vehicles sold also surged over 16 per cent to 822,475 units in H1 over the previous year. But net profit stood at Rs 4,040 crore, against Rs 3,892 crore last year, rising 3.8 per cent. The company attributed this low growth to lower non-operating income, the impact of firm commodities, and higher advertisement expenses. “Commodity prices, especially of metals like steel, copper, aluminium and zinc, and plastics have moved up by 150-250 basis points over last year. Overall discounts are higher in the market, compared to last year, as there is limited pull even though our company is growing sales at double-digit,” said Ajay Seth, chief financial officer, Maruti Suzuki. The country’s biggest two-wheeler maker, Hero MotoCorp, sold 3.87 million units during H1, growing 8.6 per cent over the previous year. Standalone revenue growth was three per cent, while profit growth softened to two per cent, against 23 per cent in H1 of FY17. The company’s profit was also impacted by higher tax outgo and factors like higher commodity prices. Automobile companies have taken some price increases in H1 of FY18 to pass on the impact of increased commodity prices. However, the pressure to maintain growth in volumes is leading to higher year-on-year discounts. “Raw material price was subdued during the second quarter (Q2) of the previous year. 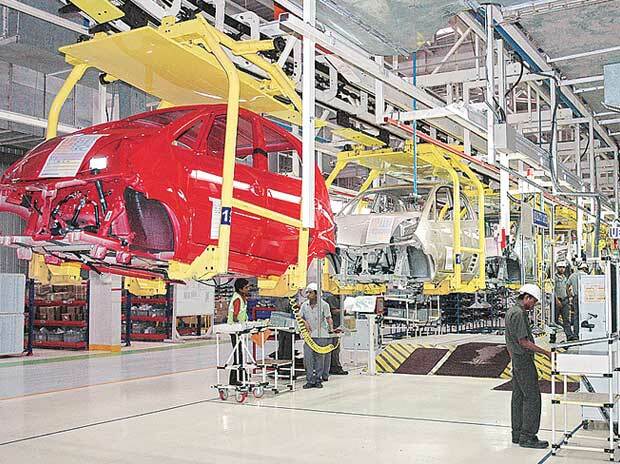 This year, raw materials and metals like steel and aluminum have firmed up, leading to marginal drop in profit,” S Ravikumar, president (business development) at Bajaj Auto, had said last month. The company’s profit in H1 declined three per cent to Rs 2,036 crore during H1, while revenue was lower by a per cent at Rs 12,201 crore. Both in the case of Hero and Bajaj, the revenue in Q2 has been taken exclusive of the goods and services tax. Sport utility vehicle and tractor maker Mahindra & Mahindra has seen its net profit grow by about seven per cent during H1 this year, against growth of 20 per cent in the same period last year. For the country’s second-biggest commercial vehicle maker, Ashok Leyland, the profit growth of 85 per cent in H1 of FY17 has changed to a decline of 24 per cent in H1 this year. This drop comes even though the sales revenue growth has improved to 12 per cent, from just 0.5 per cent last year. Discount on commercial vehicles has been on the higher side this year as manufacturers clamour for more volume after a flat FY17. Chennai-headquartered two-wheeler maker TVS Motor has seen its profit growth tone down to 15 per cent in H1 of FY18, against 28 per cent last year. However, it happens to be the only company (among those who have declared results) to maintain a double-digit profit growth. Analysts said all the companies are under pressure to maintain volume growth and ensure better capacity utilisation. The consequent discount-led growth along with firm raw material price is cooling the profit growth.